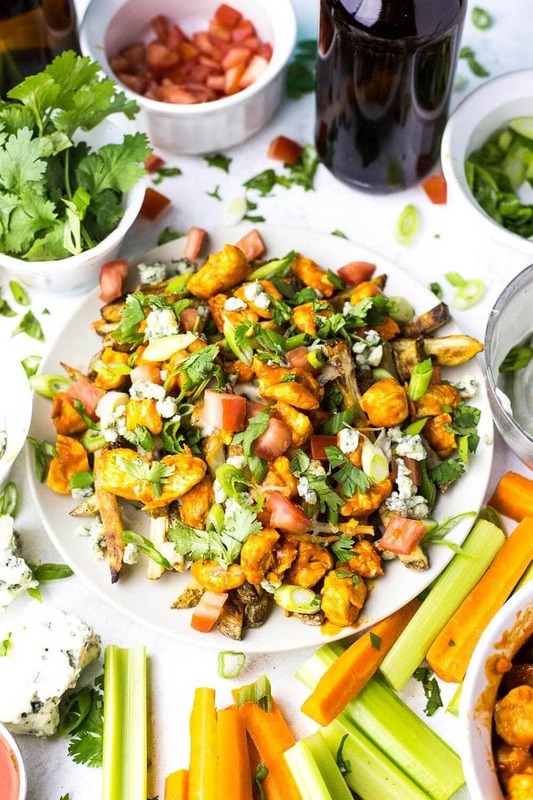 These Loaded Buffalo Chicken Fries are a healthier alternative to traditional game day food, made with homemade oven fries and topped with mozzarella and blue cheeses! 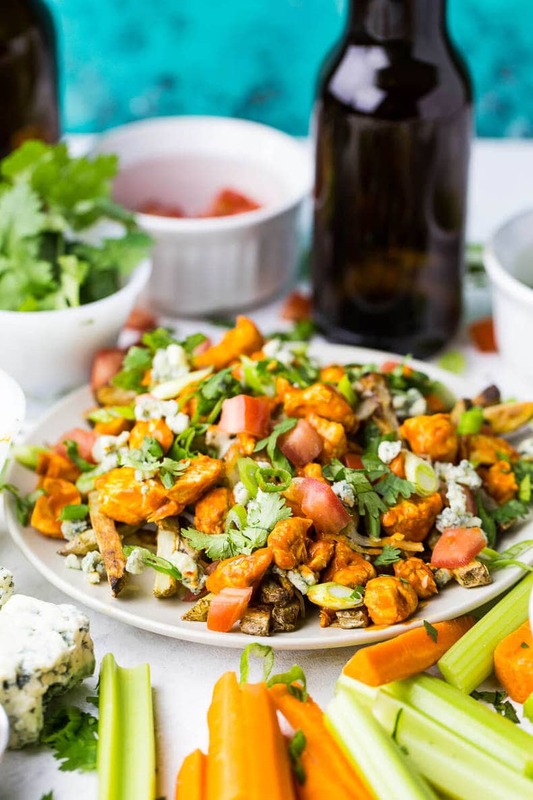 So, tell me you're gonna make these Loaded Buffalo Chicken Fries for Superbowl Sunday, okay? I have officially perfected the formula for amazing oven fries. I'm sorry I'm in a very braggy mood today. 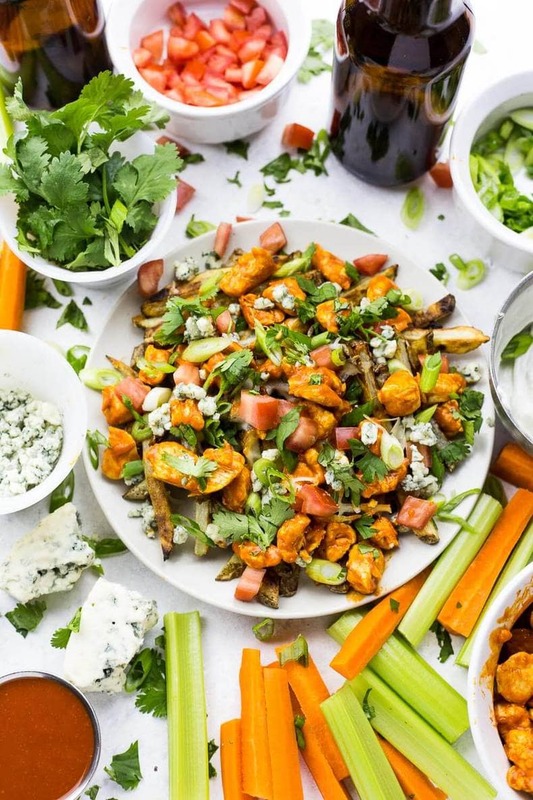 But seriously, why ever eat fried fries again when you can make them much healthier, wholesome AND delicious? I mean, these things are so healthy, you could technically eat them everyday. Fries all the time. That's exactly where my head is at.? 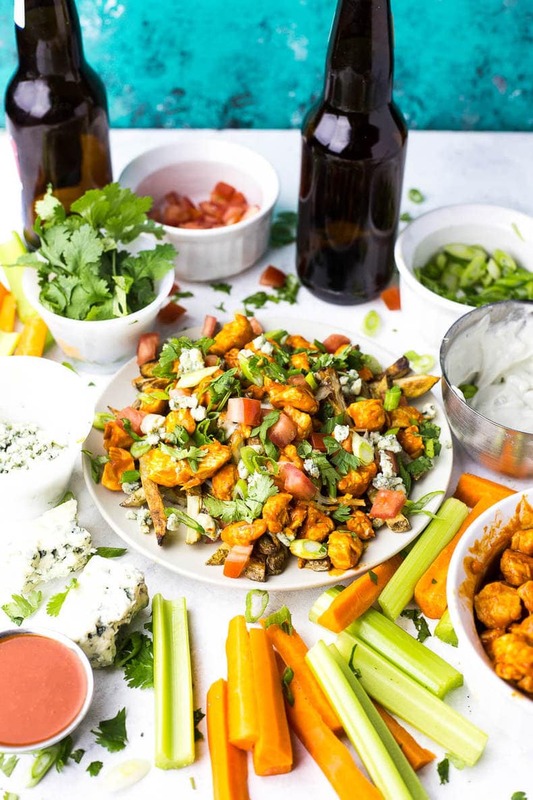 Have I mentioned that these Loaded Buffalo Chicken Fries are seriously the most PERFECT football food? I don't often celebrate Superbowl Sunday unless someone else has planned to host it. I used to live in a condo that was too small to do much hosting (and didn't have cable…yeah that was a problem…?) so I would have to rely on others to throw a big bash. At my parents' house, the Canadian Grey Cup in November is more of an event, albeit a small one – more like an excuse to eat ALL OF THE JUNK FOOD.? One of the more memorable Superbowl parties I've been to was four years ago, when I was just finishing up my bachelor's degree at the University of Toronto. I was actually sent a Facebook memory of all the selfies from the occasion this morning and despite the fact that I didn't take many pictures of the party itself, it reminded me of this FAB wing contest that was held. Basically, the idea was that everyone brought their own sauced up wings, and there was a prize awarded to whoever's wings were the best. Don't ask me what the prizes were. I just remember blue cheese and ranch galore, along with about 50 billion different kinds of hot sauce. 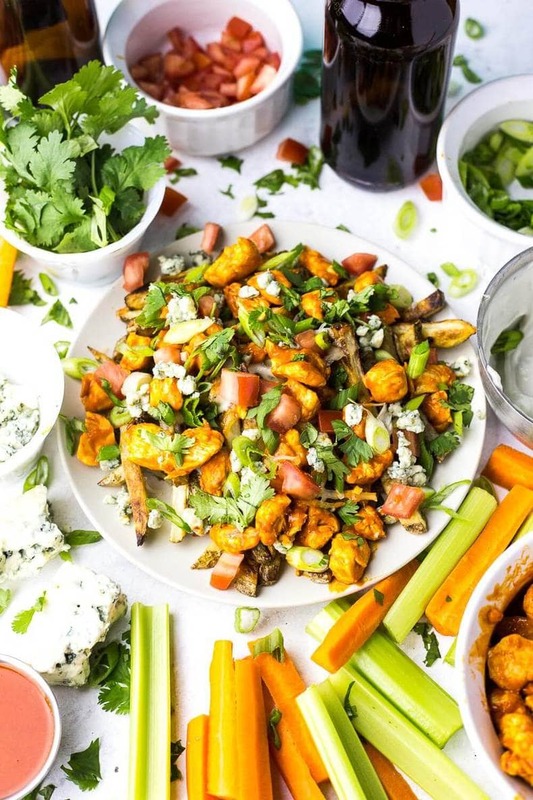 There were platters and platters of wings spread out on giant tables at my friend's brothers' condo, and piles of potluck-style appetizers and all the different kinds of dip you could ever want. Seriously, I really only like football because of the food. Gimme a beer, gimme a giant plate to load up, and I'm one happy girl. Who's winning? I don't care! Sorry if I've offended any of you die-hard football fans out there.? 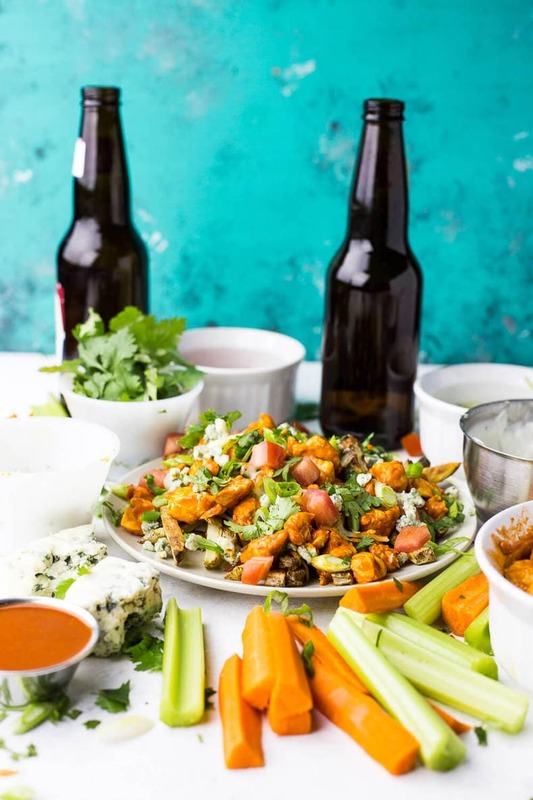 The thing is with football food, you usually end up eating far too many chicken wings, too much chips and salsa and guacamole and chili cheese fries that you are literally going to implode.? The solution to this overeating problem is having your own little football food party. 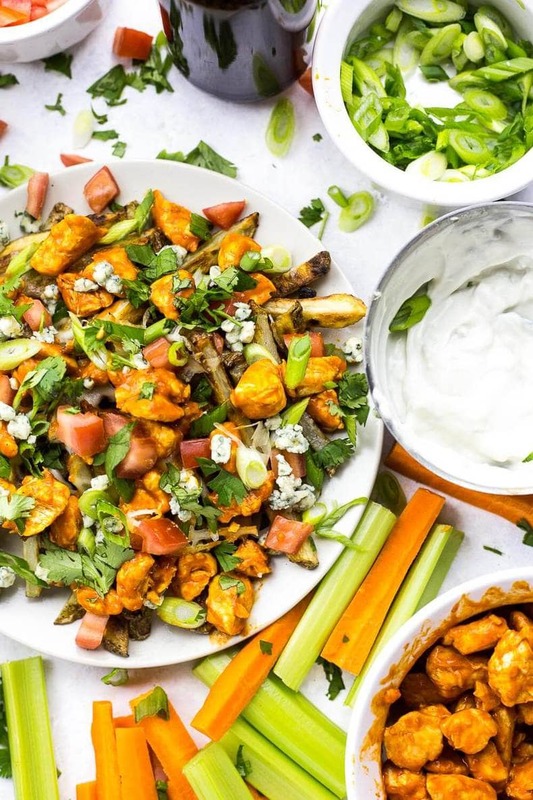 Loaded Buffalo Chicken Fries you might say. With my healthy homemade oven fries and homemade blue cheese dip. Oh yeah, I just went there. Cut your potatoes EVENLY using a mandoline or just by being very careful – sometimes I will trim down an individual fry if I feel it's too flat on either side to ensure it will cook evenly. Cutting the right fry shape by hand gets easier to do with practice – we're looking for a perfect, even square shape people!!! BOOM. The way you eat fries will be forever changed my friend.??? 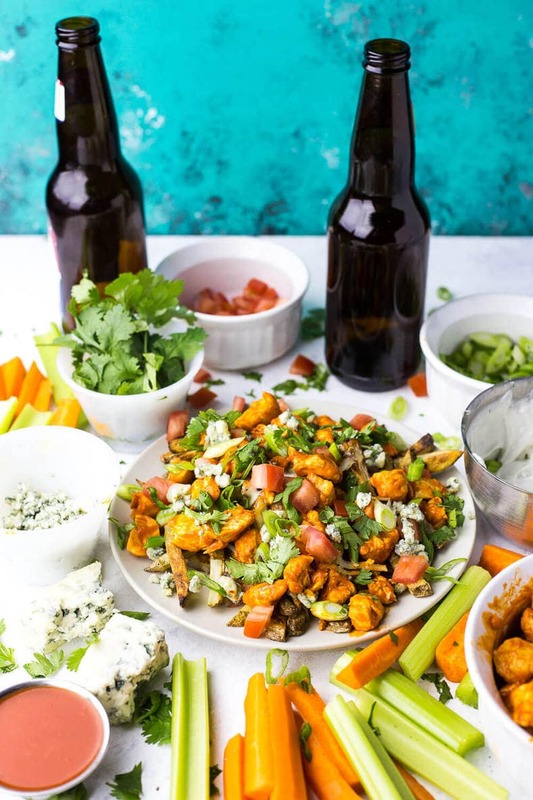 Of course if you don't have time you can always go the frozen fry route and just load 'em up with some buffalo chicken and all the toppings pictured here. I won't judge you. 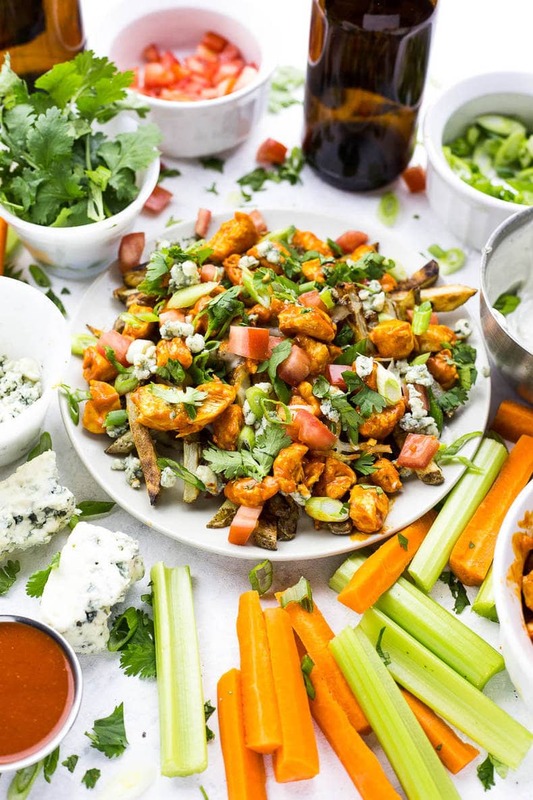 Well friends, will you be making these Loaded Buffalo Chicken Fries? 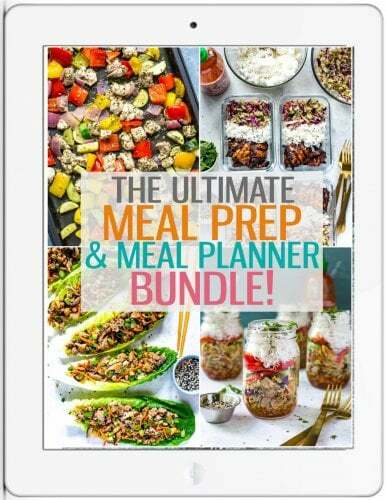 I’d love to hear what your dinner menu is gonna have on it this Sunday. What team are you rooting for? Or are you like me and are just here for the food? Reach out to me on Instagram, Twitter, Facebook or in the comments – seriously, I’d love to talk football food!? Preheat oven to 450 F. Slice potatoes into fries, then rinse under cold water to remove as much starch as possible. Dry fries with a clean towel, then toss in a large bowl with olive oil, paprika, salt and pepper. 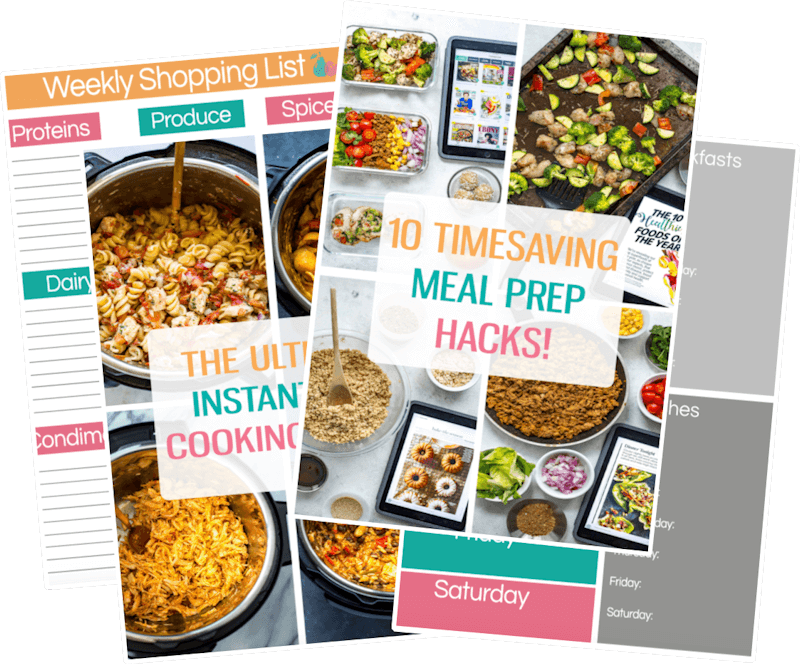 Line two baking sheets with parchment and insert both into oven on middle rack, cooking for 13-15 min. Flip fries, then cook another 8-10 min. Meanwhile, heat olive oil in skillet on med-high heat. Add chicken and salt, sauteeing for 3-4 min until browned. Add buffalo wing sauce and cook for another 8-10 min until cooked through. Remove from heat and set aside. Remove fries from oven when done cooking. Top with grated mozzarella and return to oven, cooking another 5 min or so until cheese is melted. Remove from oven and top with chicken, blue cheese, green onion, chives, tomatoes and cilantro. Serve immediately and enjoy! I fully admit I’m ordering pizza tomorrow for the Super Bowl, but these look fantastic! No one does oven fries better than you, my friend!